A must for every papermaker. This most comprehensive book on the subject sheds light on every facet of a time-honored craft and offers complete instructions on how to duplicate its exquisite results in the West. Part 1, The Craft in Japan, draws on the author's experience learning to make paper in Japan and documents Japanese papermaking as it has been practiced for centuries. Part 2, The Craft in the West, gives step-by-step instructions for the two methods of Japanese papermaking. 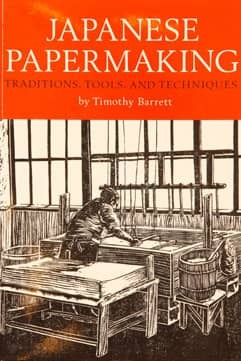 Every aspect of papermaking is explained in depth, including cultivation of paper mulberry in the West, weaving the flexible mold surface (su), and evaluation of the finished paper. There is also an excellent essay by Winifred Lutz on "Non-Japanese Fibers for Japanese Papermaking". Wonderful illustrations throughout by Richard Flavin. 328 pages, republished in 2006.